L’auteur-éditeur britannique Josiah Conder (1789-1855) est surtout connu pour son The Modern Traveller, un ouvrage en trente volumes décrivant la géographie de nombreux pays. N’ayant jamais voyagé lui-même à l’étranger, il s’y est adonné à un travail de compilation, comme par exemple dans sa description des pyramides égyptiennes, pour laquelle il se réfère à Richardson, Caviglia, Salt, Bruce, etc. Le texte que j’ai choisi ici est extrait du vol. V., 1830. 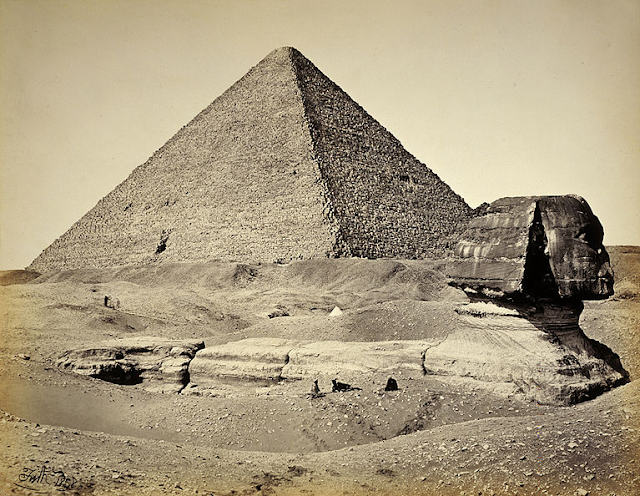 “But by far the most brilliant of Mr. Caviglia's discoveries are those to which he was led in the laborious process of uncovering the great Sphinx in front of the Pyramid of Cephrenes. His first attempt was not satisfactory, owing to the great difficulty of the undertaking. He commenced his operations by digging a very deep trench on the left or northern side, near the shoulder, about twenty feet wide at top, and three only at the base ; but, in spite of all their planking, the wind drove back, at night, more than half of the sand which they had cleared away in the day. By this trench, however, he ascertained that the external surface of the body below is composed of irregularshaped stones, built up with much care, and covered with red paint ; and that the joints mentioned by some authors, are nothing more than veins in the stones. "On the stone platform in front, and centrally between the outstretched paws of the Sphinx, was found a large block of granite, fourteen feet high, seven broad, and two thick. The face of this stone, which fronted the east, was highly embellished with sculpture in bas-relief, the subject representing two sphinxes seated on pedestals, and priests holding out offerings, beneath which was a long inscription in hieroglyphics, most beautifully executed ; and the whole design was covered at top, and protected, as it were, with the sacred globe, the serpent, and the wings. Two other tablets of calcareous stone, similarly ornamented, were supposed, with that of granite, to have constituted part of a temple, by being placed one on each side of the latter, and at right angles to it. One of them, in fact, was still remaining in its place : of the other, which was thrown down and broken, the fragments are now in the British Museum. A small lion couchant in front of this edifice, had its eyes directed towards the sphinx. There were besides, several fragments of other lions rudely carved, and the fore part of a sphinx, of tolerable workmanship ; all of which, as well as the tablets, walls, and platform on which the little temple stood, were ornamented with red paint, a colour which would seem to have been here, as in India, appropriated to sacred purposes. In front of the temple was a granite altar, with one of the four "horns" still retaining its place at the angle. From the effects of fire evident on the stone, this altar, it would seem, had been used for burnt-offerings. On the side of the paw of the great Sphinx, were cut several indistinct inscriptions in Greek characters, addressed to different deities, one of which appeared to be a mere play upon words ; another, commencing with the usual phrase, tos proskunêma (adoration), ended with the name of Aurora ; and a third contained the word paxôn, one of the Egyptian months. On the second digit of the paw was sculptured, in pretty deep characters, an inscription in verse, of which the following elegant translation has been furnished by Dr. Young, to whom the learned world are indebted for supplying the illegible words in the original. Of Egypt's plains, and calls the Nile his own. Like Vulcan powerful, (and like Pallas wise)." The signature gives it a more than common interest, which will not be weakened, if it should be decided, that it is to be ascribed to the celebrated historian whom Gibbon has dignified with the epithet of the 'elegant and philosophical Arrian'. "On the digits of the southern paw were only discovered a few of the usual dedicatory phrases in homage of Harpocrates, Mars, and Hermes. One inscription gives, as Mr. Salt reads it, to the Emperor Claudius, the extraordinary appellation of agathos daymôn, an instance of flattery which can only be outdone by that of another inscription, lately discovered in Upper Egypt, where Caracalla is styled 'piissimus' on the very same stone from which the name of his murdered brother Geta had, probably, been erased by his own orders. The edifices on which the inscription appeared, were placed on two elevated platforms, on the outside of the altar, and directly in front of the animal ; as if "intended as stations for the Roman emperors or prefects, to view the solemn rites performed in the temple and at the altar in front ofthe Sphinx". This singular monument has been, like every thing else in Egypt, the subject of very opposite representations. Dr. Richardson says : "The features are Nubian ; the expression is particularly placid and benign." Denon speaks of it in similar language. The expression of the head, he says, "is mild, benign, and tranquil, the character African ; but the mouth, the lips of which are thick, has a sweetness of expression and a fineness of execution truly admirable : it is flesh and life." The Author of " Scenes and Impressions" confesses that he was disappointed by it. "It has neither the size, nor the majesty, nor the sweetness with which it is usually represented." Mr. Salt states, that, like many other travellers, he felt, at first, that the praises lavished by Norden, Denon, and others, were greatly exaggerated ; but, he adds, “the more I studied it at different hours of the day, and under differents effects of light and shade, the more I became satisfied that they had barely done justice to its real merits". This gentleman had the advantage of contemplating at his leisure this imposing monument, when laid open in front to its very base, with the fragments of its supposed beard resting beneath its chin ; its huge paws stretched out fifty feet in advance from the recumbent body ; with all the appendages of a temple, granite tablet, and altar spread out on the platform before it ; and he admits that these interesting objects, which had for ages been buried deep inthe sand, undoubtedly tended to exalt the main figure in his estimation. For want of these objects by which to judge of the scale of its dimensions, travellers would be very liable to underrate at least the magnitude of the figure ; nor should it be forgotten, that it was intended to be looked up to from its base. Herodotus makes no mention of this enigmatical figure ; yet, from the great disintegration that it has suffered, Dr. Richardson supposes that it can hardly be less ancient than his time. Pliny, the first author who mentions it, merely states its position to be in front of the pyramids, adding, that the natives called it the tomb of King Amasis, and said that it was brought there ; which, he remarks, could not be true, as it is cut out of the rock ; but he offers no opinion as to its design or origin. The sphinx, in the Greek mythology, is generally represented with the countenance of a beautiful female and the body of a lion. The head of this sphinx, however, is now supposed to be that of a man ; the beard found between its paws being considered as decisive on this subject. "The expression of almost all the Egyptian figures, remarks Dr. Richardson, is so particularly mild and interesting that, without the accession of the beard, they might all pass for females. This figure was entire in the time of Abdallatif, who describes its graceful appearance, and the admirable proportion in the different features of its countenance, of which he particularly mentions the nose, the eyes, and the ears ; adding, that they excited his astonishment above very thing that he had seen in Egypt." (1) Of the immense difficulties which Capt. Caviglia had to encounter, some idea may be formed from the statement, that the slightest breeze or concussion was sufficient to set in motion the loose particles of sand, and to occasion the sloping sides of the mass to crumble down, forming a cascade of sand. On the southern side of the paw, the whole body of Arabs were employed for seven days without making any sensible advance, the sand rolling down in one continual torrent. When Dr. Richardson visited the Pyramids in October of the same year, "the Arabs and the wind had replaced the greater part of the covering, and the lower extremities oi the Sphinx were as invisible as before". (2) This stone is now in the British Museum. The inscription, with a translation, is given in the paper from which this account is taken, Quart. Rev. vol. xix. p. 414. It purports to have been erected, by the inhabitants of Busiris in the Letopolitan district, near the Pyramids, to the Emperor Nero. Another inscription, found near the same spot, is dated in the reign of Antoninus Pius and his son Verus. (3) Dr. Richardson states that " both on the temples and on the tombs, the Sphinx is frequently represented with a pyramid or an obelisk between its paws." (4) In the dedicatory inscription to the Emperor Nero, that monarch is stated to have been present at the "lawful rites" celebrated here, and to have worshipped the sun, "the overseer and saviour of the world".